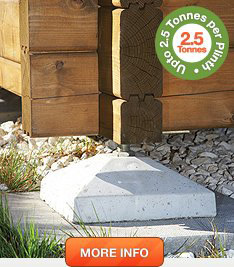 The Swift Plinth is an ideal foundation system for small to medium Log Cabins, Garden Offices & Studios, SIPS Buildings, Timber Frame Buildings and Decking. 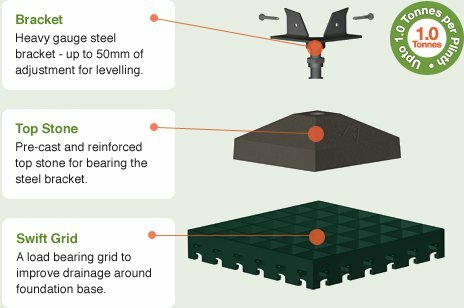 The Swift Plinth product is suitable for medium weight applications up to 1 tonne per plinth and spans of no more than 2 metres. 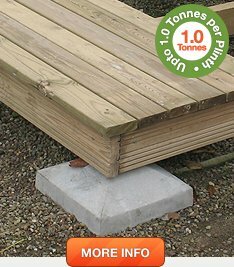 This makes it ideal for small to medium Log Cabins, Garden Offices & Studios, SIPS Buildings, Timber Frame Buildings and Decking. If you have any questions or concerns on the Swift Plinth and whether it’s right for your project, contact us and we will be happy to help you.